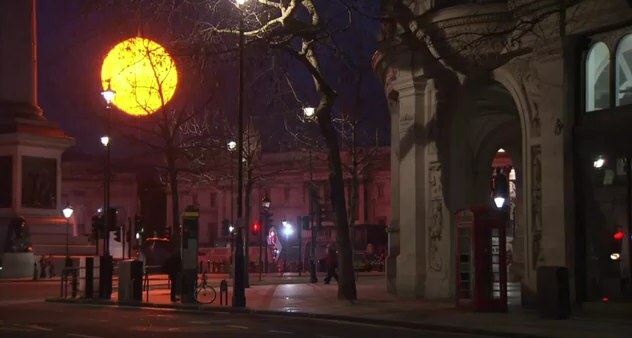 Tropicana continues their Brighter Mornings campaign with a man made sun installation this morning in Trafalgar Square. At 6AM - one hour prior to natural sunrise - the man made sun began to rise. It will stay lit until 7:33PM this evening as well giving Londoners and extra three hours of daylight. Created by Greyworld and taking over six months to create, the manufactured sun is 30,000 times bigger than a football, has a surface area of 200m2 and weighs over 2,500kgs. Its internal light source produces the equivalent of 60,000 lightbulbs, 4-million lumens of light. Still it's no match for the actual sun but who doesn't love a little extra light now and then? Especially in Winter when it's so dark all the time. Check out the video of this morning's illumination and a "making of" video.